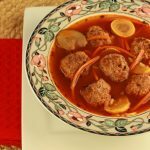 Here is a warm, savory, Italian meatball soup that is paleo and low carb. 1 lb ground Italian sausage or ground beef. 1 tbsp coconut flour where to buy coconut flour. 1 14 ounce jar of organic diced tomatoes. 1 medium yellow squash chopped. 1 medium carrot chopped or shredded * optional. ½ medium onion minced *optional. 2 tsp organic Italian seasonings. In a large mixing bowl combine all the meatball ingredients and knead with your hands. Form meatballs with meat mixture by rolling a tbsp between hands. Once meat balls are formed, place meat balls in an oiled or greased skillet on medium high heat. Brown the meatballs until all side are browned (does not need to be cooked completely). Turn crock pot on high and place pancetta, or bacon on the bottom of crock pot. Add minced garlic to the crock pot (can also use a stock pot on the stove top). Place browned meatballs on top of pancetta and garlic. Add chicken broth, entire can of diced tomatoes, chopped zucchini, chopped yellow squash, chopped carrots, minced onion, Italian seasonings, garlic powder, and sea salt. Cover and cook on high for 5 hours or on low for 8 hours. I usually put the crock pot on high for 4 hours then turn it down to low for 2 hours (if using a stock pot then bring to a boil, turn down heat to low & cover and simmer for 30 minutes). Serve garnish with Parmesan if you can have dairy.